I’m a big Oakely fan. I remember my first pair of Factory Pilot Eyeshades back in the 80′s. I had yellow ones to match Greg Lemond’s. Then there were the Frogskins, Razor Blades, the Iridium phase….ah those were the days. One of my all-time favorites were the original Sub-Zeros. Today you’ll find quite few Oakleys in my collection: 00, Why 3.0, Gascan S, M Frame, Zeros and Minutes. Also somewhat contrary to the often said line “If I bought expensive sunglasses, I’d lose them or sit on them,” I’ve never lost a pair and when one pair did break I received a free warranty replacement pair from Oakley. Getting the right fit is essential for comfort, protection, and even optical performance. You may have heard industry terms like “European Fit” and “Asian Fit”. If sunglasses tend to sit too low on your face or slide down your nose, touch at your temples or cheeks, or feel narrow at the sides of your head, try our Asian Fit. The tabs below show all the technology we put into making these frames fit with perfection. At first glance the term ‘Asian Fit’ seemed a bit direct for me? What do you think? LOL makes perfect sense to me. Also remember that Oakley is based in southern California – the population looks different than in other parts of the country. Direct is good. Oakley knows their market and the vernacular of their consumers. Well played. Jeremy: Direct probably is good. It’s better than marketing something as ‘urban’ when you mean something else. I worked for a large, regional optical company for several years. When I joined the company as their PR director, they categorized their stores three ways: suburban, boutique (for the high-rent district stores) and ethnic (for the city stores where most of the clientele was African American). Talk about direct! I coaxed them into rebranding the city stores as “urban”. I think the “Asian” approach is actually good, in this case. It’s clear, and I believe, searchable. 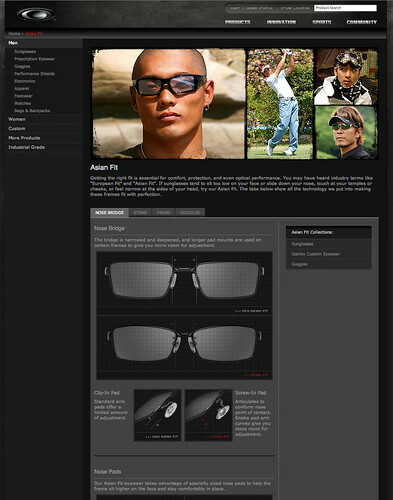 I just got my pair of Asian fit Oakley’s today (Custom Half Jackets) – they’re great! Lashes don’t hit lenses and they sit well on my face (not too low, not too high). Can’t wait to go for a run or ride with them! Thanks Oakley! I remember Malcolm Gladwell talking about Spaghetti Sauce a few years back and how there used to only be two kinds- chunky or not- and how marketing people tried to always get the largest common denominator and everyone just had to settle for the average. It was only much later- in the 90′s actually, that marketing got more and more segmented, such that there are over 30 types of spaghetti sauce on the shelves today, because people are different, the have many varied tastes, and many “fits”. Of course, manufacturing has gotten a lot more lean and efficient so that we can make more customized goods at still great prices. I’m Asian and I have no problems. I think this is a smart move by oakley. Looking for (sun)glasses has been hell for me. Asians (generally) have low/no nose bridge and high cheek bones. Good move by Oakley. Oakley is a luxury brand, and at least in America, Asian is the only ethnic group that “overspends” on luxury goods, even more so than their white counterparts. Have any of you walked into a high-end watch boutique? Asian guys everywhere trying on Pateks and Lange watches. This term “asian fit” on the surface appears to be a marketing move to broaden customer base but at the root reflects a shift in economic dynamics favoring (East) Asians.